I Root for Celery Root! It's been so long since my last post that I must admit I feel a great sense of pressure to write a really exciting one. With travel and computer issues behind me I’m just going to dive in right where I left off. I promised to share some of my culinary findings from my trip to Copenhagen and Switzerland and I will not disappoint. But I must let the suspense linger just a little bit longer as I’ve yet to practice or test the inspirations I want to recreate. I do have a Swiss recipe to share though – one that I’ve been meaning to try for over 5 years. It must have been about 5 years ago, perhaps even longer, when I visited Switzerland and spent a delightful afternoon with my Aunt Irene. She is a very talented artist and her bright airy apartment adorned with her many canvases always fills me with inspiration. On the particular afternoon that I am remembering she prepared the most delicate flavorful mid-day meal of fish and vegetables spiked with the essence of Vermouth, hints of spicy curry, and a few dashes of dill. She gave me the recipe printed in German and I stashed it into my travel journal which then sat on my bookshelf waiting to be rediscovered until now. After my Mom helped translate the instructions and ingredients I set out to recreate this memorable meal. I was intrigued for several reasons: one was that I finally had a reason to buy celery root – a vegetable I’ve walked by a hundred times wondering to myself what one does with it, and second I was so excited to experiment with the flavors of Vermouth. I’m so pleased with how this dish turned out and I’m so glad to have dusted this recipe off – it will now be added to my repertoire. My first experience with celery root has left me wanting more! As one might expect it does have a similar flavor to celery but the root is mellower and when cooked gets a little bit sweet. The Vermouth added fantastically sweet notes throughout this dish and when blended with the curry it created the most fantastic light sauce. The curry imparted its sprightly yellow hues that were punctuated by little green dashes of dill. This is a unique blend of flavors that makes for a delicious dinner any night of the week. 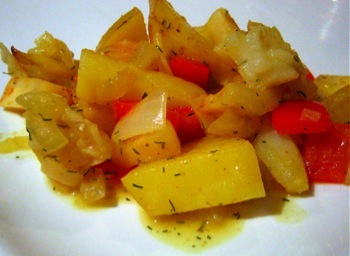 2) Begin by chopping all of the veggies (potato, celery root, red pepper, onion). The celery root just needs to be peeled of its gnarly rough exterior and the inner white part should be cut into small cubes – about 1/2 cm thick. The smaller the cube the faster it will cook. 3) Over medium heat place a large sauce pan on the stove and heat half a tablespoon of butter and 1-2 tablespoons of olive oil. When hot add the onions and sautee until they soften and start to brown. 4) Cut the cod into 2 inch pieces and sprinkle with salt and pepper – add to the pan and cook for about 3 minutes and then add 1/3 cup of the Vermouth and continue to cook for about 3 more minutes. Sprinkle with dill (about 1/2 Teaspoon) and remove from heat. Add the fish and sauces to a buttered casserole or gratin dish and set aside. 5) Place sauce pan back on the flame and add the other 1/2 tablespoon of butter and another 1-2 tablespoons of olive oil. Heat it up and then add the onions – allow them to soften and add the rest of the chopped veggies: celery root, red pepper, potato. Sautee for about 12 minutes stirring occasionally. Cook until veggies are soft. 6) Add 2/3 cup of Vermouth to the veggies along with the curry and Aromat. Cook for another 3 minutes. 7) Add the veggies and sauce to the gratin form with the fish – mix together. Add another splash of Vermouth (about a shot glass worth) and then place in the oven for 10 minutes. It’s been way too long since your last post! But I’m glad to see that you’re back and I cannot wait to hear all about your trip! G — The picture of the dish looks amazing. Great colors… and the sauce w/ the dill… ymmmmm. I’ve never cooked with Vermouth, so thanks for the inspiration! You’re back! YAY! Congrats on getting that recipe translated and made so beautifully. I am going to give it a try! Sherri – Thanks! Let me know if you try it. Dan – If you haven’t played with Vermouth Bianco I think you’ll totally be a fan! Ivonne – I know it’s been WAY too long and I’ve missed blogging so much. I’m so glad that things have settled down at work so I can get back on track! i can not find a place to buy celery root. Can you help me ?